Bring songbirds into your garden using the Aspects Seed Tube Wild Bird Feeder. The six ports on this sizeable feeder each have their own perch, allowing several birds to dine at once. Each port is reinforced by sturdy brass colored metal, keeping them intact for years to come. The clear, UV stabilized polycarbonate tube keeps the seed level visible at all times and is perfect for holding 1.3 quarts of seed. An internal seed baffle at the base of the unit directs seed to the two bottom ports, so the feeder empties completely without leaving a dirty residue. The innovative Quick-Clean base removes in seconds when the two black plastic tabs are squeezed, allowing the feeder to be emptied quickly and cleaned completely. The sturdy die-cast metal cap slides up the hanger for quick, convenient cleaning and filling, and its antique brass color adds a classic feel to the unit. With its durable construction, this feeder will faithfully serve the birds in your backyard, season after season. Use the attached metal loop hanger to hang this item from a hook or branch, or pole mount it using a 3/4" threaded adapter (not included). 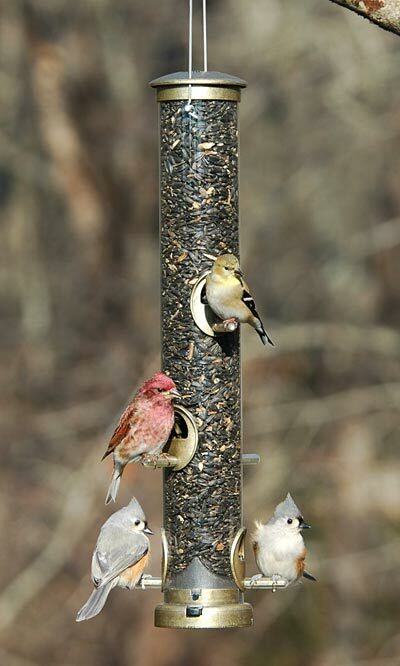 Watch birds dine in your yard from this Seed Tube Wild Bird Feeder. Made in the USA. Lifetime guarantee.